Services — Dynasty Roofing, Inc.
Let our professional staff assist you by carefully determining the best shingle for your home. Our hand-crafted workmanship and inovative products will provide the best warranties in the industry. Our friendly staff will be glad to assist you in the claims process by using our expertise in meeting with your Adjuster determine the required scope of work. Call today to learn more about this service. Let our experts solve your minor roofing problems . We offer reliable Leak Repair Wind or Tree damage repair as well as Skylight & Chimney flashing repair. We even repair roof damage caused by pesky critters. Seamless Gutters are the best way to go when it comes to deflecting water away from your home, specifically the foundation. Most jobs are completed in one day with many colors to choose from. We specialize in full Seamless Aluminum, High-end Copper, Half Round Gutters as well as Decorative collector boxes & Leaf guards. Skylights can transform any room into the best room or space in the house. Available in a variety of sizes and designs, they can easily be incorporated into your ceiling and roof design. With the introduction of more natural light into your home from a skylight you will experience rooms that feel more spacious and beautiful. Trapped heat and moisture can raise energy costs and damage roof systems as attic temperatures can easily reach 150°. Proper ventilation is now required for all Shingle Manufacturers warranties. Additionally, adequate ventilation will remove moisture and heat from the attic resulting in significant savings on utility costs. 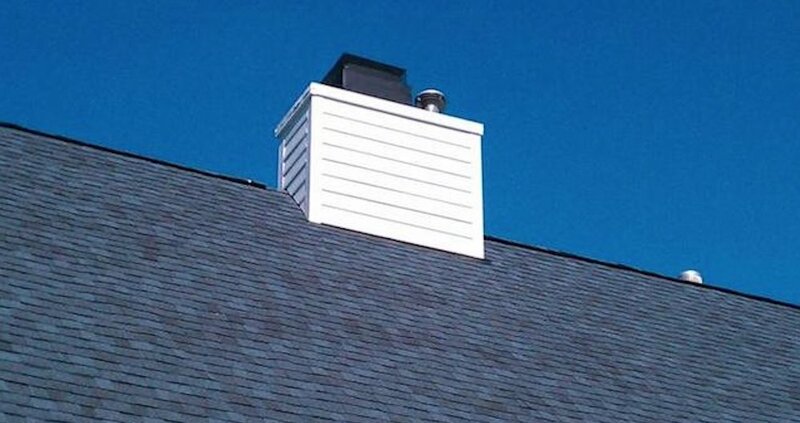 We specialize in the repair and replacement of chimney siding, corner trim, chimney caps, as well as, flashing repairs. We also install Chimney Crickets (diverters) to help resolve chronic leak issues. Solar Tubes are a cost effective way to brighten any room by using “developed optics” with channeled daylight. Passive light is allowed through without the normal heat of electrical light sources. Many homeowners appreciate the hassle-free installations since drywall repairs are not required. In addition to being great roof installers, our roofing crews are skilled in working to address problem areas such as rotted soffit, fascia, and even selected wood siding.